Here is our new workroom! A lot has gone on in the past year and we decided to relocate from Loughborough town centre to the outskirts. It was for various reasons, parking was one of the issues, and also the area we were in wasn’t quite suitable. 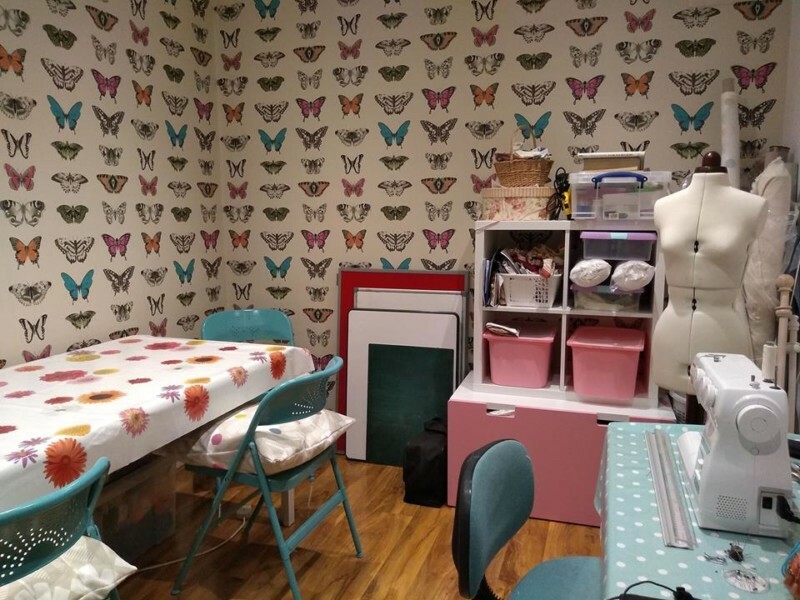 We have now created a fabulous workroom which can accommodate our sewing classes and our cosy crochet and knitting evenings. We did a full refurbishment on the room, having the walls completely re plastered and the ceiling finished off. New electrics were added and better lighting makes the room really bright and visual for all of our lessons. Wooden flooring has also been laid down, this make picking up pins and threads so much easier, no more random pins stuck in the carpet! We chose harlequin wallpaper for their vibrant butterfly design. the colours in the wallpaper matched our brand and we also wanted to stimulate and provide more colour and make the room more exciting. Another addition to our room was is our brand new tailors dummy! We are always dressmaking whether it is requests for ballroom dresses, bridesmaid dresses or dressmaking in our sewing classes. Either way this is an invaluable investment and I can’t imagine how we survived without one for so long! As you can see we have already started and had lessons in our new room. People who have attended the lessons have been really positive and we hope to continue teaching and sharing our knowledge of sewing and crochet and of course our main mission of being creative! If you like what you see and you want to come along to any of our classes then just get in touch, we will be happy to see you.